This precious future drummer brought Zach the drumsticks during worship. The solution when a team member feels ill? The church prays over her. God provided Moses (left) and Musa (right) to translate so that we could understand each other, and we praised God that the language barrier will be broken in heaven. One of my favorite sayings, which has been repeated several times to the pastors who are in the village this week, is that “If you give a man a fish, you feed him for only one meal; if you teach a man to fish, you feed him for a lifetime.” There’s a lot of fishing going on this week in a tiny village in Dihombo who I believe God has big plans for. Last year, Pastor Kassim who is the pastor of the village was given a vision by God to be a self-sustaining community. He prayed for pastors to be trained so that they could train other pastors and encourage them in the gospel, and he prayed for medical trainees to be given basic medical knowledge so they could check the health of people in his village. Because Pastor Kassim’s heart is to make God’s glory and name known, God provided for him both resources that he prayed for and more. Below is what it looks like when God gives a man a vision, he prays for it and trusts God for provision. The blind were given sight. You read that right. As people were waiting to be seen by the doctors at the medical clinic, Amanda and Victoria were fitting people with prescription glasses. The joy on people’s faces as they could finally SEE was moving. As a person who can’t read the big “E” on the chart at the eye doctor, I can relate to the frustration of everything being a big blur. Here’s the difference- I can hop in my car and drive to the eye doctor. These people just have to learn to deal with not being able to see. Can you imagine when they put something on their face that can help them SEE? When’s the last time you thanked God for sight? 100 people were treated at the medical clinic today in 5 hours. You read that right. 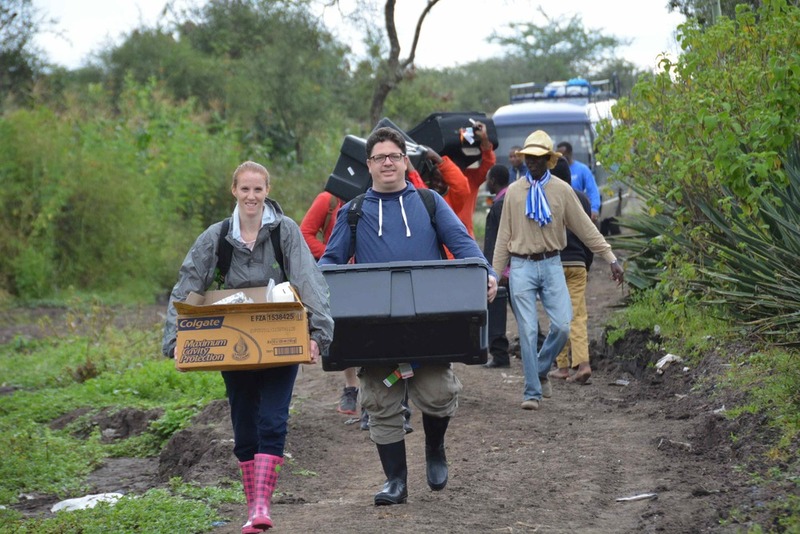 Our team partnered with the Tanzanian doctors to effectively treat 100 people. One woman found out she was dying of stage 4 breast cancer. While sadly there was nothing the doctors to do, her family now knows what is wrong and will be able to make her last days as peaceful as possible. One child had a fever of 104 and a terrible infection that will now be able to be treated. As our team was treating people, they were also training 5 people from the village in basic triage so that they can be a part of caring for the villagers. Here’s the cool thing- the medical clinic is in the church, so people are associating healing, prescriptions and sight with Jesus…..Think He had that planned? One pastor walked miles to learn more about how to shepherd and teach his church. You read that right. He WALKED MILES. 10 pastors sat under a tent and listened to a pony-tailed chick from America share what she has learned about pastoring and preaching….funny- that sounds like a vision statement from some church in Birmingham that I know (learning and sharing a better way to live in Jesus). 10 people from America won’t ever be the same. We realize that we are a part of God’s greatest glory which is His name being made known, and we are experiencing our greatest joy which is participating in worship with other nations. Experiencing the Great Commission is the ride of a lifetime. Beth making a doctor's visit fun! Jordan was a master at the pharmacy- Nurse Zach helping him out. We love and miss you. Though we are miles away, you are close to our hearts. - if all flights can't have first class seating only, there should be ONLY window and aisle seats- no middle seats please. - Zach needs his own reality show, and if you know him you KNOW you agree and would watch it! Anyway, all is well, God is good, and we can't wait to get to Dar Es Salaam late this evening (I think it's Thursday- who knows at this point?) We love and miss you and thank you for praying for us. You have to look REALLY hard to see the Statue of Liberty but she is behind us! The team said goodbye early yesterday morning (and I mean EARLY- our flight left at 2:10am) to our Tanzanian friends and thankfully made it home safely last night. We are coming home with a mix of emotions- more than ready to see family and friends and eat Chick-Fil-A (OK that last one is my personal desire but I feel more than certain that the rest of the team would agree with me) and yet with a sense of excitement that our partnership in the Gospel with our Tanzanian brothers and sisters which has been developing over the last 6 years is about to explode. We heard from the Bishop on Sunday that his desire is to see more churches rise up in rural areas and for more and more people to hear the Gospel. You might be asking yourself- how can we help with that when we live 10,000 miles away? After all, isn't there plenty of ministry happening at home? The answer to first question I will answer below. The second question is yes- you don't have to travel across the road to share about Jesus. We have the opportunity to do that every day in our workplaces, our homes, our friendships, etc. In fact, your greatest influence is with people you see every day or regularly because they have a chance to see your faith lived out, notice a difference, and desire what you have. So, why do go to Tanzania and other places (our current partnerships are also in the Philippines, Honduras and Colombia)? The short answer is because there are resources that we have access to which can benefit other places. Let me share an example. In the States when a person feels called to be a pastor, they can choose to go to receive formal training in a seminary if they so desire without many roadblocks. Of course, there are potential roadblocks- after all, school costs money- but we have options available to us through student loans, etc. Plus, we don't have to walk or ride a bike hundreds of miles to get to school. 2) You can go on an International trip and offer your God-given skills i.e. medical, dental, business, etc to help in the pastor's village. This is incredibly helpful because when people hear a medical or dental clinic is happening, they come from all over which helps expose them to the church. 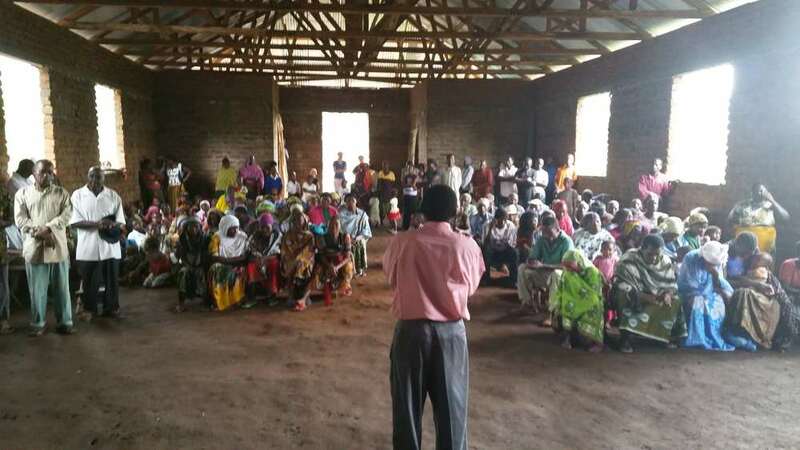 The pastors we currently work with in Tanzania tell us that their church attendance grows significantly after a team comes due to the exposure and interest peaked during clinics. 3) Our church and other churches can help by sending pastors to help train indigenous pastors. The Bishop has asked us to host a pastors' conference in Tanzania next year, so I am praying about asking pastors to participate. Rural pastors in Tanzania would come and receive formal training over an intense 2 week period. You could also sponsor a pastor during this intensive by helping with hotel and food. All of these things empower pastors and their congregation. The pastors feel more confident in their calling and are able to learn new skills and new ways of teaching. As they grow in confidence, God expands their vision for their community. For example, Pastor Kassim in Morogoro told me that his dream is for his women to have a sewing machine so they can make clothes for money. He also is praying that people in his village could be trained medically and build a simple medical clinic so that they could treat their own people. They are able to get meds through the government at a discounted rate (in case you were wondering because that was a question I had). Please hear me say this- the hope of Tanzania (and any other place for that matter) lies in the church sharing about Jesus. Yes we take medical supplies and training and it makes a profound difference but the sad reality is that the average age in Tanzania and most other 3rd world nations is shockingly low. The hope that people need to hear about is Jesus. Physical medicine lasts for a time; spiritual medicine lasts for an eternity. Both are important. Whew! That was a lot to write, and a lot to read. Please be in prayer about what God might be calling YOU do to. No matter what it is, you won't regret if you take a step out to support a pastor, go on a trip, or pray for what God is doing around the world. He will truly give you the adventure of a lifetime if you will only- in the words of John Ortberg- be willing to take a step and get out of the boat. Thanks for listening. See you soon. We have almost come to the end of our 13 day journey in Tanzania. This morning was icing on the cake as we were able to do ministry at Kibowa Orphanage. Let me tell you a little bit about this special place. The orphanage was formed in 2005 by four women who had a heart for children who had lost their parents primarily to AIDS. Since most children with AIDS are instantly considered outcasts, the children simply had no place to go. Fortunately, God is a father to the fatherless and provided for them by laying it on the women's hearts to open a place where the children could be safe, warm, and fed. Over the years, Mountaintop and other churches have supported the children's education, and now several of them have earned degrees. This morning we were able to meet the four children we have been sponsoring. It is very meaningful to see children who had no chance to now be flourishing under the love of their caretakers and through the support of people who care. There are now 2 caretakers- Amina and Safael. Interestingly enough, one is Christian and one is Muslim and yet they have peacefully come together to minister to these children. They offer both Islamic and Christian teaching. That might seem strange, but our team (and now we invite you) is praying that the light of Jesus will shine strongly in the darkness and that the Muslim children as well as Amina will come to know Jesus as their personal Lord and Savior. It is a very special place, and the children are well cared for. Amina and Safael have a wonderful vision for the orphanage to move into a bigger location (there are currently 51 kids in 4 rooms) and to start a vocational school so that the children who are not supported in their education will be able to learn a trade and make a living. 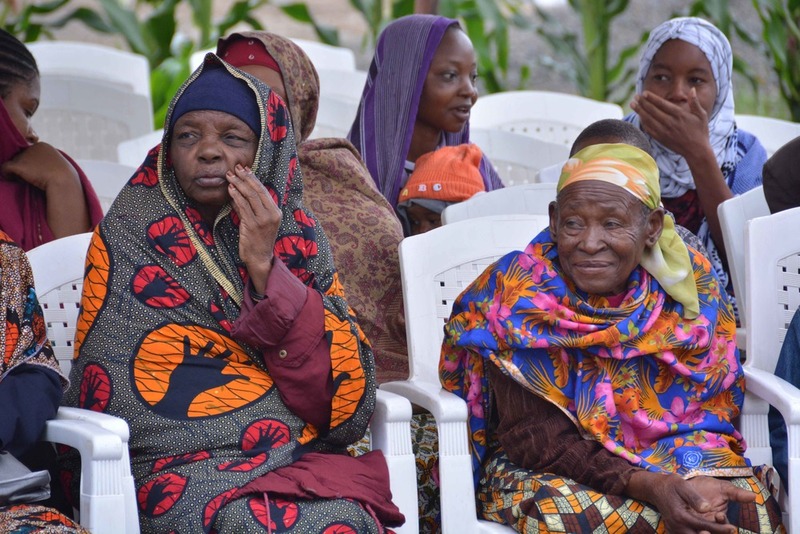 It is truly a God-given vision, and we are eager to see how we can partner with these precious women in the future. Our group was able to love on the kids for a few hours through crafts and games and songs. The pictures below will illustrate how much it meant to them and even more to us. Our flight leaves in a few hours, so please be in prayer for our travel. It has been an amazing trip, and though we are all very ready to come home, we leave behind a little "peace" (pun intended) of our hearts. Thank you all for joining us on this journey. The children sang songs for us first! If there is ever a doubt that God can use anything to spread the Gospel, this is a sweet Muslim girl wearing a crown of salvation and a Gospel sharing T-shirt. Fred was amazing with the kids! How can she not steal your heart? Cathey with Amina and Safael who are wearing aprons handmade by a sweet Mountaintopper. We had the chance to worship today at a local church pastored by Bishop Mwizarubi who is the bishop of more than 5000 churches. As bishop, he oversees all of the pastors in his denomination in Tanzania. He is a very powerful but humble man. When we arrived at church, we did a brief children's program, and then we all worshiped together in the main service. Their worship is so free, and it was truly an honor to be with them. One of the most moving parts of the service was being able to give (on behalf of Mountaintop) rural pastors bicycles which they can use as a mode of transportation. It seems crazy to us how much joy people have over a bicycle, but it is literally the ONLY way they can afford to get around. Bishop shared with the church today that he still has the bicycle given to him 22 years ago. Can you imagine the memories it evokes in a man who is now one of the most powerful men in Tanzania? God has walked with him every step of his journey and taken him from humble beginnings so that he can now encourage and support other men who are beginning the same way. The pastors were not on hand to collect the bikes as they will be coming to a pastors' conference in a week, and Bishop understandably did not want to ask them to make 2 trips. So, his elders accepted the bikes, and they will personally present them to the pastors on June 8. Mountaintoppers, because of your generous tithes, the gospel will be spread in Tanzania by the pastors who will receive these bikes. THANK YOU for your generosity! Thank you for your prayers- it really was a great service!! Please enjoy the pics below and consider yourself a part of our worship today. 1) The highlight of the day was literally and I mean LITERALLY being in the middle of a herd of elephants. They surrounded our cars as if we were merely part of the landscape. It was truly one of the most incredible experiences ever. We saw elephants from 5 months old (which I'm still trying to figure out how to fit into my suitcase...) up to 70 years old. They are amazing beasts. 2) We saw 4 lions eat their fresh kill. We felt very sorry for the warthog they were consuming (poor guy never saw it coming), but it was surreal to see the lions eating in their natural habitat. Tomorrow we go to worship at Bishop Leonard Mwizarubi's church. Some of the team are leading the children's program, and I (Mari Beth) will be preaching. We appreciate your prayers. Enjoy some of the beautiful animals we saw today. The worlds fastest animal- cheetahs go up to 62 mph. If you look closely, you can see blood on her cheek. Poor warthog. Simba got him. This guy was all by himself and struggling a bit since he only had one tusk which he probably lost from a fight. In case you only think of African landscape as dry and dusty, check this out. Hey everyone! Today was one of those days that you wish you could freeze and do over and over and over. This morning the entire team helped with a craft with the kiddos called Gospel tshirts (see below picture). It took all hands on deck, but it was so fun! We encouraged the children to wear their T-shirts and remind people that Jesus loves them. Never too young to minister! After the craft, we did songs and games. One of the most moving times from today was when the children gave us all beautiful shukas (sort of a wrap/shawl/scarf) that the Massai (the Native Americans of Africa) wear. Here we were in a place where people have nothing, and they were so eager to give us something. It was truly the most tear-jerking, precious moment. Something from nothing=true gift. Let me take a second to explain why it is so important to do children's ministry here. In most churches, though the children are loved, there is no specific ministry for them. Since the church services are 3-4 hours long, you can only imagine that the kids struggle a bit in service (even though they are the most obedient children I've ever seen). So, when a team comes and gives value to children's ministry, churches and pastors note it and a few have begun to incorporate a children's staff and ministry. Of course, we are learning things from Pastor Rogers and his congregation too- i.e. we (as in the team) agree we all have room to grow in generosity, spontaneous worship, gratitude etc etc. After time with the cute kids, we did an impromptu afternoon church service at Pastor Rogers' request (he is the pastor we partner with in Kisongo) where Jameson Werking (our honorary team member from Indiana) did a great job preaching about God's ALWAYS faithfulness. We worshiped with the people, and we had a time of appreciation and thankfulness. After the end of such a beautiful day, we were also able to appreciate God's natural beauty when the very tip of Kilimanjaro decided to "peak" (pun intended) out for us (apparently that is very rare), and we got some beautiful pictures. I know it's hard to truly embrace what I'm writing about, so can I take a moment to ask you to pray about going on an international trip? You certainly don't have to leave Birmingham to do missions. We partner with tons of wonderful local ministries (as we experienced during the serve week! ), and I encourage you to serve with one!!! But if you feel at all a little tug as you read this, let's talk. I would love to connect you to the right trip. We love and miss you. Gospel Tshirts ready to be on display to the world! New way to share the Gospel. 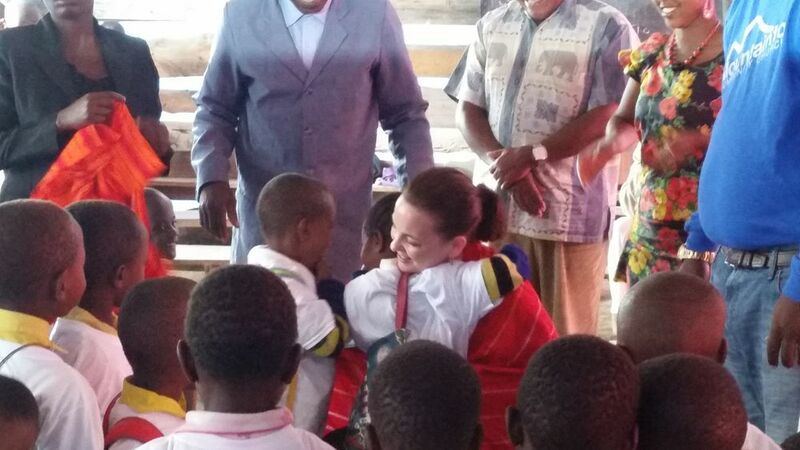 Leah hugging children as they gave her the shuka. Something from nothing= true gift. God's final blessing for the day- the peak of Kilimanjaro. Hey family and friends! Wednesday was a long day of bus riding, but we finally arrived in Arusha about 9:00pm. Yesterday was a great day in Kisongo (about 45 minutes from Arusha). We arrived to Pastor Rogers church around 9am and half of the team did a medical clinic, while the others worked with the children. A few high's from yesterday included being able to have more time to spend with patients in the clinic and teach them about how to take care of themselves, watching children who made a simple crown out of construction paper TREASURE those crowns and wear them proudly while they were playing, enjoying the welcoming spirits of all of the villagers who made us feel at home and being thankful for the perfect weather God has provided for us. I could go on and on, but the below pictures will speak for themselves. We pray all is well with our loved ones, and we miss you. Fred and Nicole carrying our supplies into the village. Princes and princesses in God's kingdom. They treasured these simple crafts! Hey everyone! Did you miss your daily blog yesterday?? I am sure you are nodding yes right now. :) The internet was down last night, so I couldn't write. Thankfully it is back up and running tonight! I am sitting here with the fantastic team eating dinner, and since you have heard from me a lot over the last few days, I wanted you to hear from them. 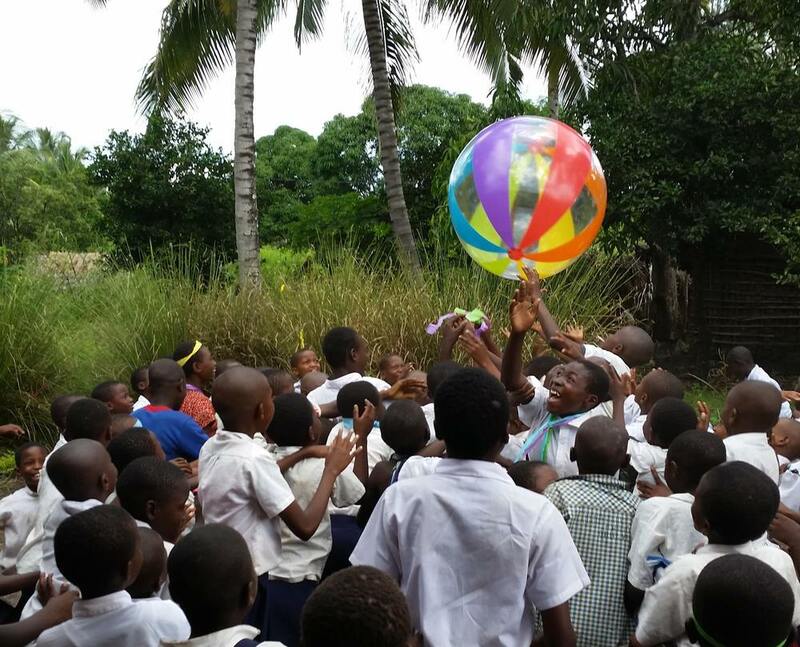 I think the pictures below will show you just how amazing the last 2 days in Morogoro have been. So, here's the dealio- each team member is sharing their joy(s) over the last 2 days, and we are sharing some prayer requests at the end. We love and miss you all. The only hard part about making fun memories is not having the others that we love here to share in them. So, happy reading and happy looking. Oh, and tomorrow morning we leave Morogoro early to head off to Arusha. Thanks for joining us on this journey. Talk to ya soon. 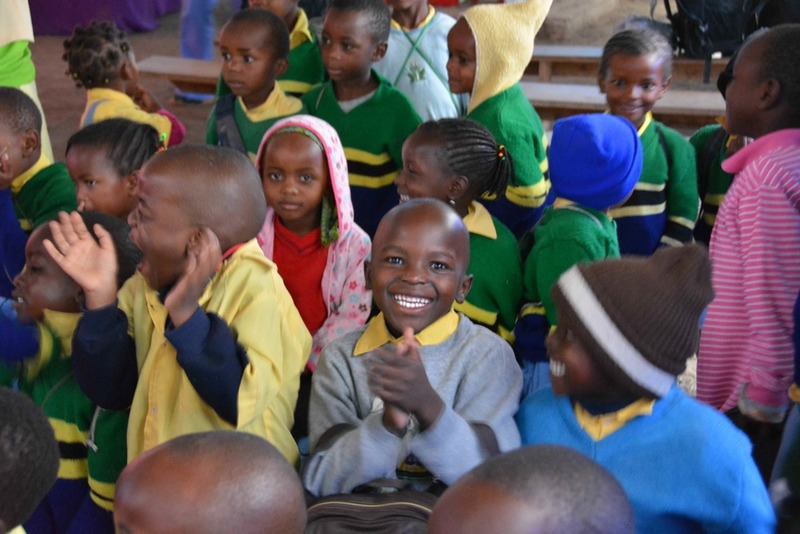 Joy #1: The people in the Morogoro church welcomed us yesterday with songs- loved hearing them worship! Joy #2: She enjoyed learning how to cook a traditional meal with the women in the church. Joy: We took bubbles to play with the kids, and when we left they made their OWN bubble wand with a stick and found a jug to pour soapy water in!! No Walmart necessary. Joy #1- Loved the opening worship in the church. The people have BEAUTIFUL voices!! Joy #2- We got more organized in the medical clinic today and were able to see and help even more people. Joy- Enjoyed helping with the pharmacy and dispensing meds so sick people could feel better. Joy #2- Seeing Pastor Kassim's church that Mountaintop helped build! Pastor Kassim was meeting in a hut and now has a building. Joy- She loved helping a woman who thought she may never able to have children, but the meds Dr. Kay is sending her will hopefully enable her to conceive. PRAISE! Joy- Meeting 3 young women who were excited to learn more about Jesus. Joy- Sylvia was super sleepy and ended up skipping dinner to catch some zz's so I will tell you that Sylvia was A.M.A.Z.I.N.G yesterday in the eye clinic. She literally gave sight to the blind as people who could not see were able to see once they had glasses. Joy- Having a chance to sit down with 7 rural pastors and encourage them. We ended up doing a Bible study "session" together, and it was fun to see their eyes opened to new ways to teach. The people of Morogoro and Pastor Kassim. Mountaintoppers, you helped build his church building with your generous tithes! The kids LOVED the beach ball!!! Dr. Kay treating sweet Nora- our team loved Nora! It's 2:45am here in Morogoro, and I am having a bit of trouble sleeping soooooo I thought I would let everyone know officially that we are here. After several long days of travel and a detour to Istanbul, we are ready to get to work in just a few hours). To all of you who know James Kopwe- he picked us up from the airport, and I gave him a Mountaintop hug from all of you who asked me to pass one on! He is doing well and has worked hard to organize our trip. Today, we will be traveling to a nearby village to do a medical clinic and an eye clinic. We will also be doing a children's VBS with a local school. I will be posting pics and maybe a video at the end of the day. Let's just say that in the video, you need to look for a lion......Talk to you soon. So.....little did we know that God had different plans for our team! We missed our connection in Istanbul and now have the chance to do sightseeing tomorrow here in Istanbul before we catch our flight to Dar Es Salaam tomorrow at 7:30pm. Just another reminder that life is much more adventurous and exciting when we walk with God. Turkish Airlines put us up in a safe hotel, and we have felt God guiding and directing us the whole way. We know He sees what we don't see and He has a reason to have us here tonight. Please continue the prayers! Pictures to come.